This laugh-out-loud gardening memoir (who knew gardening could be funny!?! ), written by William Alexander, had me in stitches. I flew through the pages with Alexander as he chronicled his triumphs and falters in the quest to keep up with the ever-growing demands of his Hudson Valley vegetable garden and orchard. 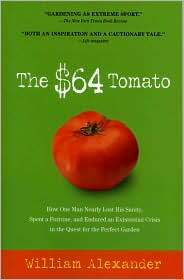 The $64 Tomato is so much more than just a book about a gardener; it’s the story of one man’s quest to do right by his family and his land, by growing real foods with real nutritional value at what winds up being the all too real price of $64 per tomato! His story is intertwined with family sagas, animal “tails”, even recipe ideas. It was the perfect readable escape to indulge in while stuck on planes back and forth from Chicago and lounging poolside on steamy afternoons in The Buff. As summer draws to a close, I tried holding on to the sizzling days and warm nights by diving into this tell-all that is equal parts how-to and how-not-to garden. I don’t even have a garden, but Alexander’s story would wet anyone’s appetite to grow green thumbs (not to mention Green Zebra heirloom toms). After all, it is tomato season. Who would have thought that a little novel about a garden could make this city slicker long to dig my hands in dirt? If you are looking for one last food-forward summer read this is the cream of the crop. It might even inspire you to set gardening plans into motion for next season…it did me. Dirt, worms and homegrown produce, here I come! That’s a promise. Check out William’s website or purchase the book here. Eat it up! I take all the credit for passing along this gem of a book to my favorite city slicker. $64 Tomato inspired me to search high and low for a Brandywine plant (search ended at Union Square Farmer’s Market of course…) that would produce heirlooms from the comfort of my Brooklyn roof terrace, and I’m pleased to report that urban gardening costs significantly less than $64 per tomato. Although, that’s what my Brandywines are worth! $64 Tomato is one of my favorites, and I can promise that reading of the calamity in Alexander’s garden will produce laughter so deep that it will make even the most worm-phobic urbanites wish for a sober page. Howdy I am so excited I found your web site, I really found you by error, while I was browsing on Google for something else, Regardless I am here now and would just like to say thank you for a fantastic post and a all round thrilling blog (I also love the theme/design), I don’t have time to read through it all at the moment but I have bookmarked it and also added in your RSS feeds, so when I have time I will be back to read a lot more, Please do keep up the great job. Mabelle, you have made my day with your heartfelt feedback. Thank you for taking the time to write me and share your thoughts. Writing a blog can be a bit like working in a bubble, so I very much appreciate hearing from my readers. Enjoy the holiday weekend and Eat it Up!